Bodymoor Heath Wharf is a place on the waterways minor waterways place place on the waterways major waterways place village town city on the Birmingham Canal Navigations (Birmingham and Fazeley Canal - Main Line) between Drayton Manor Bridges (There are two bridges here, a foot bridge and a swing bridge. These days the swing bridge is usually open.) (2 miles and 7¾ furlongs and 2 locks to the north) and Dickens Bridge (Minworth) (4 miles and 1½ furlongs and 9 locks to the southwest). The nearest place in the direction of Drayton Manor Bridges is Curdworth Lock 10 No 37 (Also called Common Lock); 2 furlongs away. The nearest place in the direction of Dickens Bridge is Bodymoor Heath Bridge; ¼ furlongs away. The water-point can be clearly seen. 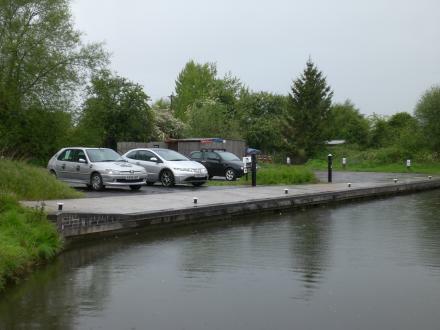 There are rubbish disposal bins at the back of the car-park, however these are marked as only for boaters on the long-term moorings, so don't get caught using them! The Dog & Doublet, Sutton Coldfield, B76 9JD — 296 yards to the south. Bodymoor Heath Lane, Sutton Coldfield, B76 0DY — 661 yards to the northeast. Bodymoor Heath Lane, Sutton Coldfield, B76 0DY — 653 yards to the northeast. 20 Tame bank, Tamworth, B78 2HS — 1608 yards to the east. Bodymoor Heath Road, Birmingham, B76 0 — 734 yards to the southeast. Labou, Middleton house farm, tamworth road, Birmingham, B782BD — 989 yards to the west. Kingsbury — 762 yards to the southeast. Bodymoor Heath Lane, Birmingham, B76 0EQ — 540 yards to the east. Lichfield Road, Birmingham — 1129 yards to the northwest. Tamworth — 1593 yards to the east. Broomey Croft Childrens Farm, Sutton Coldfield, B76 0EE — 606 yards to the northeast. Bodymoor Heath Lane, Sutton Coldfield, B769 — 738 yards to the south. Bodymoor Heath Lane, Sutton Coldfield, B76 0EE — 966 yards to the northeast. Bodymoor Heath Lane, Kingsbury, B76 0 — 970 yards to the northeast. Broomey Croft Childrens Farm, Bodymoor Heath Lane, Bodymoor Heath, Kingsbury, B76 0EE — 213 yards to the northwest. dog lane, Sutton Coldfield, B76 9JD — 297 yards to the south. Unit 6, Cheatles Bridge, Dog Lane, Bodymoor Heath, Sutton Coldfield, B769JD — 418 yards to the south. Tamworth — 989 yards to the west. Sutton Coldfield — 43 yards to the south. Bodymoor Heath Lane, Sutton Coldfield, B76 0DY — 346 yards to the east. Bodymoor Heath Lane Sutton Coldfield, Sutton Coldfield, B76 0DY — 329 yards to the east. Dog Ln, Sutton Coldfield, B76 9JD — 301 yards to the south. Middleton House Farm, Tamworth, B78 2BD — 982 yards to the west. Bodymoor Heath, tamworth, B76 9 — 1118 yards to the southeast. Wishaw, Sutton Coldfield — 937 yards to the west. Marston Farm Hotel Dog Ln., Birmingham, B76 9 — 418 yards to the south. Brick Kiln Lane, Hunts Green, Tamworth, B78 2BA — 1552 yards to the northwest. Unit 1 Cheatles Bridge, Dog lane, Bodymoor Heath, Sutton Coldfield, B76 9JD — 218 yards to the south. Unit 2 Cheatles Bridge, Dog Lane, Sutton Coldfield, B76 9JD — 313 yards to the south. Bodymoor Heath Lane, Sutton Coldfield, B76 0DY — 787 yards to the southeast. bodymoor heath lane, Sutton Coldfield, B76 9 — 136 yards to the south. Kingsbury Staffordshire, Birmingham — 1582 yards to the east. Kingsbury Water Park, Sutton Coldfield, B76 0DY — 862 yards to the southeast. Echills Wood Railway, Kingsbury Water Park, Bodymoor Heath Road, Kingsbury, B760DY — 728 yards to the southeast. The Tie Barn, Middleton House Farm, Tamworth Road, West Midlands, Tamworth, B78 2BD — 995 yards to the west. Bodymoor Heath farm, Birmingham, B76 9JD — 205 yards to the south. 1377 yards to the south.